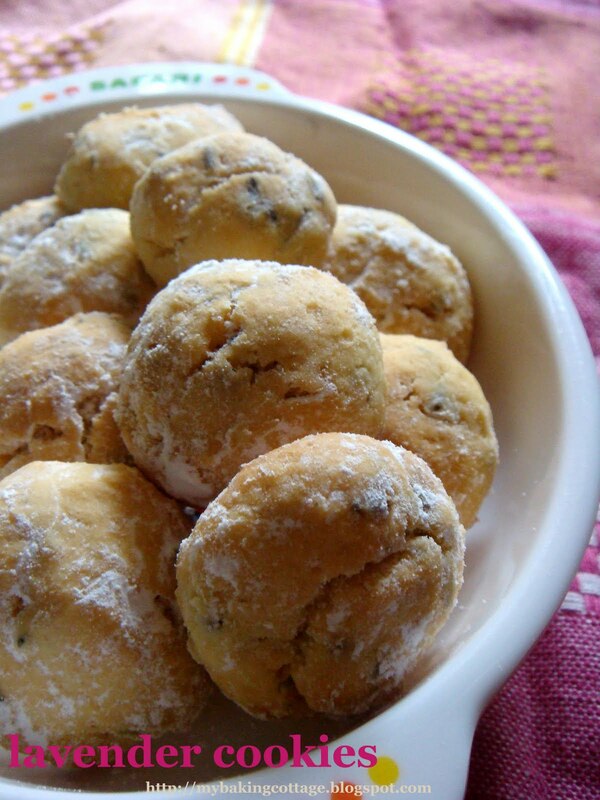 The lavender cookie was a recipe adapted from Angie's Recipes. I find that there are not many lavender cookie recipes around online and I can't find a single one in my recipe books. I'd wanted to give a go at Happy Homebaker's lemon lavender shortbread but when I read how she described the dough as rather unmanageable, I thought I had better err on the save side by googling for a more full proof recipe, hence eventually I settled for Angie's lavender cookies. I did not make much modifications to her recipe except that I had used butter instead of margarine, reduced the sugar slightly and I made it smaller. As I did not press the cookie flat enough, the first batch that came out was a little soft, some did not have the "crunch" you'd want in a cookie. So I had to send to the oven to bake for another 3-4 minutes. Preheat oven to 160°C. Sift flour once. Line baking sheet with parchment paper. Beat butter, sugar, salt and vanilla extract until softened. Fold flour and ground almonds into butter mixture using a spaula. Chill dough for about 20 minutes. Roll dough into small balls, about 8g each (I did not measure and I just roll according to my preferred size) and place on the baking sheet. Bake for about 20 minutes (I used about 18 minutes as my dough was smaller), remove from heat and leave to cool on wire rack. Once cooled, dust with icing sugar and store in an airtight container. Oh.. thanks for posting up this recipe. 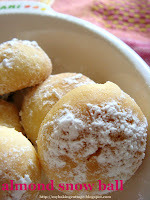 We miss this cookies, it's really a nice snack for me and my hubby. Aimei, I love Russian teacakes too!! The cookies are one of those bakes I learned when I was in America! It's been eons since I last made them! Gotta make some when the right time hits! Btw, with regard to your question on my goma cookies by Kevin Chai, I'll get down to it by tomorrow evening (after work) hopefully. Been insanely busy, as usual!! Argh! So, do check back for my reply. Sorry if I've been so slow! Yippee! Thanks for sharing these cookie recipes! Think I will bake them proto this weekend, heehee! You know who will be the happiest kids then, lol! I love your blog's new layout! It's sooo pretty. It makes your blog look really bright and cheery. I kind of miss the old layout, but then I like having things stay the same as before. I don't see any lavender in this recipe. How much would you put in?